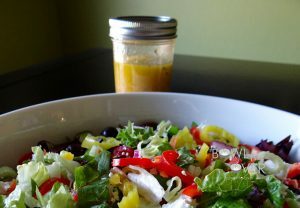 Greek Salad Dressing - Love a bright fresh salad dressing, how about you? Even better when you make it yourself. It's easy, tastes better, saves you calories, time & $'s - love that! In a medium bowl add the garlic, oregano, mustard, vinegar, salt & pepper. Whisk well to combine. Slowly add the olive oil & continue to whisk briskly to emulsify. 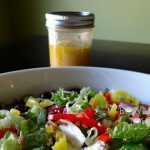 Greek Salad Dressing is easy and so delicious. It's quick and saves you a ton of money compared to store bought salad dressing. Making your own salad dressing will offer you & your family a better alternative to the chemically laden store bought version! (Sorry to get up on my soap box....but it's true! 😀 ) Give this a try, I bet you'll really enjoy the fresh taste! Love the idea of this dressing. Simple and tasty!